Amaranthus albus. Robin R. Buckallew @ USDA-NRCS PLANTS Database. (Accessed 3/2014). 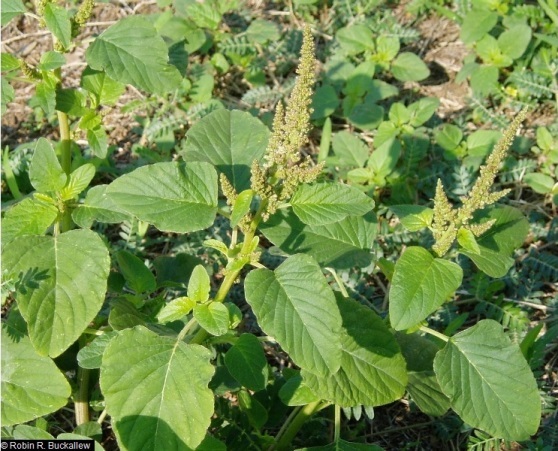 Amaranthus albus, is an annual C4 herb (Downton 1971; Costea and Tardif 2003), to 1 m, pale green to whitish, slender, erect to ascending, rigid, bushy-branched. Leaves alternate, stalk elongate, blades of early stem leaves to 7 cm long, widest above middle, tip rounded, base tapered to stalk, pale green, veins conspicuous, leaves of flowering branches to 0.3 cm. Flowers very small, colorless, sexes separate, in small, axillary clusters, amid bristly bracts longer than flowers, 3 sepals (no petals); mostly self-pollinated (Costea and Tardif 2003); blooming and fruiting July-Oct.
Fruit dry, 1-seeded, lens-shaped, to 0.17 cm, enclosed by sepals, wrinkled when dry, seed to 0.1 cm. Seeds dispersed when old stem breaks and dry plant blows across the ground, a “tumbleweed”. Origin: Native to Midwestern states. Notes: Host to the Bemisia argentifolia (Homoptera), also infected by a number of fungi (Costea and Tardif 2003).